Iâ€™m delighted to tell you that on Wednesday, December 12, Internet Explorer correctly rendered the Acid2 page in IE8 standards mode. 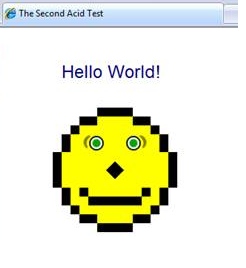 The Acid2 test was developed by the Web Standards Project (WaSP) as a challenge to browser developers. In a single page, the test makes use of a broad range of features from several different web standards that developers have wanted to have in browsers for some time, and it uses them to display a deceptively simple smiley face. The first browser to support the Acid2 test was Safari 2.0.2, back in November 2005. Since then, iCab and Konqueror have announced their own support. The current beta of Firefox 3 comes close, but isnâ€™t there just yet. With this announcement, it looks like Internet Explorer may actually beat it to the punch! These are all incredibly useful features that the other major browsers have supported for some time, but which have not been available for real-world use because of the lack of support for them in Internet Explorer. Thatâ€™s all about to change. Support for CSS tables alone will be enough to drastically change real-world CSS page layout techniques, making them much easier to learn and use. Microsoft is promising to release a beta of Internet Explorer 8 in the first half of 2008. The big question for web designers who will be hoping for swift adoption of the new browser: will it run on Windows XP, or require an upgrade to Vista? Microsoft has published a fascinating video record of the rendering of the Acid2 test in internal builds of IE8 over the past six months. The video also includes an in depth interview with Dean Hachamovitch and Chris Wilson. Recommended viewing with a few holiday warm-and-fuzzys from Microsoft.